This polymer clay jewelry set is a very easy beginner project, whether you are new to polymer clay, new to jewelry making, or both. Just follow the step by step instructions and you will have a pretty set of jewelry to give away as a gift, or keep for yourself! When you get compliments on your jewelry it is so nice to answer "Thank you, I made it myself"! 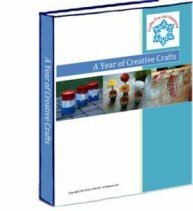 If you have never worked with polymer clay before, you may want to read my Tips and Techniques article first, which will give you some helpful pointers. Approximately 0.5 oz. 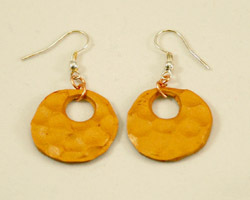 of polymer clay in your color of choice. The metallic or shimmery colors look best. 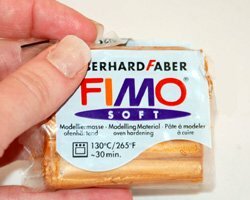 I used Fimo Soft in Gold. Four jump rings (jump rings are tiny metal circles, found in the jewelry finding section of your local craft store. They are sold in multiples and come in a tiny bag). 1. 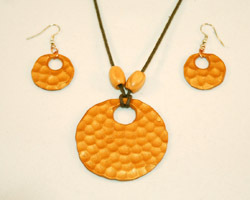 Begin the polymer clay jewelry set by conditioning your polymer clay by kneading it between your hands until it is warm and soft, and holds together well without crumbling. 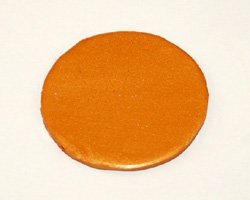 Below is a photo of the type and color of polymer clay I used for this project. 2. 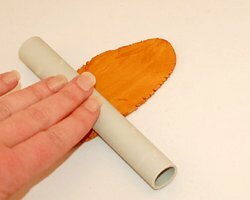 Flatten the clay with a brayer or small rolling pin. Or, if you use a pasta machine, run the clay through at the largest setting. 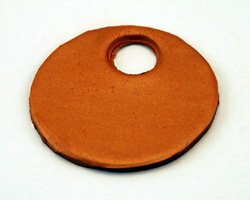 The clay should be about 3 mm thick. 3. 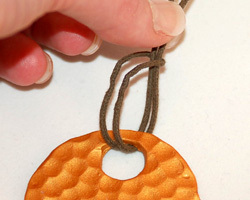 Look around the house for an object to serve as a circle template for the necklace pendant, such as a small glass. I used the bottom of pop can. 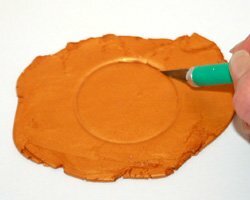 Place the object on the clay to make a circle impression, or trace around the object to make the impression. 4. 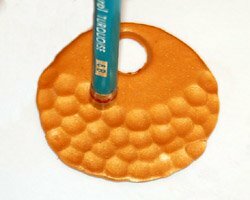 Using the exacto knife or cutting tool, cut the circle out. 5. 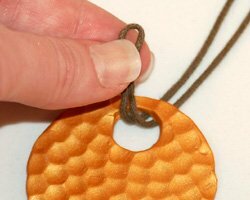 Find a smaller circle template to make the smaller hole in the pendant. I used the end a broad marker with the cap on. 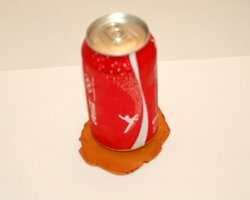 A plastic soda bottle cap also works well. * Spotting on rubbing alcohol alone (try the end of your paintbrush, and just try a tiny amount) creates white spots! The colored ink will run away from the alcohol, creating amazing effects. 6. 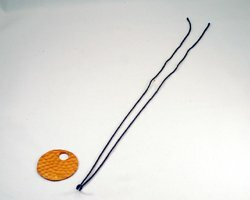 To add some dimension to the pendant, use the blunt end of a pencil to push little circles all over the pendant. Overlap the circles slightly as shown. This works best if you begin near the bottom of the circle and then work your way up. 7. 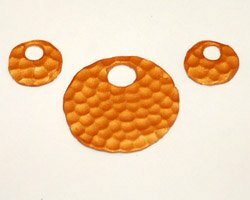 To make earrings, do the exact same thing but find smaller circle templates. 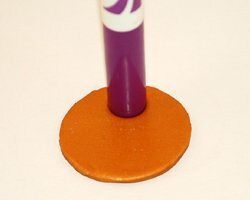 I used a plastic soda bottle top as the outside template, and the end of pencil for the inner circle. When you are cutting out the inner circles in the earring, put it close to the edge. This is because you will need to get a jump ring around the inner circle and the outer edge. 8. Following the manufacturer's instructions on the clay, bake the clay pieces in the oven for the specified amount of time and allow them to cool completely. 9. Once cool, you can add a cord to the necklace. 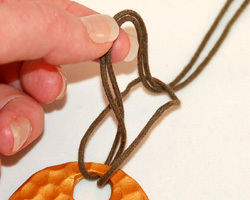 To loop the cord around the pendant, fold the cord in half. 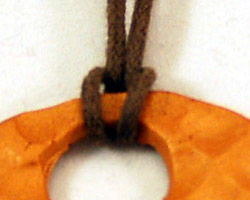 Thread the middle of the cord (where the fold is) through the circle of the pendant. Bring the loop up and spread the loop apart. Thread the long loose ends of the cord through this opening in the loop. Then tighten the knot. Use the pictures below for help. To wear my necklace, I usually just tie the ends of the cord around my neck. This way I can change the length depending on what I'm wearing. If you want a more finished and polished look, simply add jewelry end clasps to the ends of the cord. 10. To finish the earrings, use the jewelry pliers to open each jump loop a bit. Once open, you can thread the jump ring on to the earring. Add another jump ring to the first one, then follow up by adding the fish hook earring. 11. 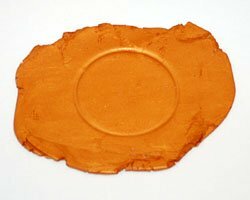 You can add a protective glaze to the pieces if you like, or add some of the shimmer powders that are available to beautify polymer clay.